MSV: Pupie Power punking Michael Russo? Pupie Power punking Michael Russo? That's the hot rumor today as there's word petitions were picked up late Friday on behalf of Frank "Pupie" Raia for the third ward City Council seat. 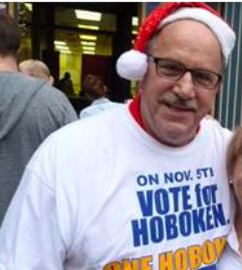 If true, Hoboken and Councilman Michael Russo may see a repeat of Frank "Pupie" Raia's third ward challenge back in 2007. That third ward council race was a barn-burner with Raia and Russo going head to head trading blows in a scorching match up. third ward City Council were taken out late Friday on his behalf. Pupie Power is on the move! The race quicky turned into a bruising affair with Raia calling on former mayor and Michael's father, convicted felon Anthony Russo to pay back the City of Hoboken owed approximately $350,000 in restitution. Michael Russo returned fire with allegations on ELEC reports not filed by his opponent's campaign. Raia countered hitting back at Russo and his cousin, Terry Castellano saying they voted for every fraudulent invoice of Gerard Lisa who bribed Michael Russo's father with hundreds of thousands of dollars. Anthony Russo would eventually plead guilty and serve a two year sentence in federal prison. At the recent June Hoboken Democratic reorganization meeting, Raia was on hand to witness a widely criticized banana republic style takeover from former Hoboken Democratic Chair Jamie Cryan. Cryan attempted to hold an orderly vote on a pro tem to run the meeting and conduct subsequent votes including for his own position of Chair but the Carmelo Garcia - Michael Russo faction hijacked the proceedings. A bizarre vote with no tally followed leading to Jamie Cryan walking out as Freeholder Anthony "Stick" Romano was installed. Talking Ed Note: To say Raia was not pleased with the highway robbery is an understatement. Now Raia who has a record of helping Hoboken residents through charitable efforts may be mounting another council bid. He currently sits as a commissioner on the North Hudson Sewerage Authority. The NHSA is currently constructing a second flood pump uptown for the City of Hoboken. The candidate filing deadline is Monday 4:00 pm at the City Clerk's Office.